These are the things that we first experience at the start of Ran, and they could be said to define the movie. The very first shot of the film shows a hunting party on horseback, and for the first few seconds, no one moves, there is barely a sound. Until one of the figures finally shifts just after the director’s credit, it almost looks like a still photograph or a painting. 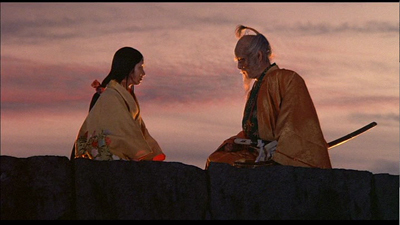 Akira Kurosawa’s 1985 masterpiece is a loose retelling of Shakespeare’s King Lear. Transplanted to 16th-century Japan, it is the story of aging feudal lord Hidetora Ichimonji (Tatsuya Nakadai). Realizing that his powers are flagging, Hidetora decides to put his oldest son, Taro (Akira Terao), in charge of his land. When his youngest, Saburo (Daisuke Ryu), raises concerns about this decision, his father banishes him from the kingdom. Sensing that the boy was right and appreciating his forthrightness, one of the Ichimonjis’s neighbors, Lord Fujimaki (Hitoshi Ueki), invites him to come live at his castle and marry his daughter. Exit Saburo, stage left. Saburo’s fears quickly turn to reality once he is gone. Taro’s wife, Lady Kaede (Mieko Harada), has a deep resentment of her father in law. He destroyed her family and took their land, and so this Japanese Lady Macbeth encourages her husband to curb his father’s remaining status. Deeply offended, Hidetora takes his retinue and goes, seeking shelter with his middle child, Jiro (Jinpachi Nezu). Jiro has other ideas, however; he’d rather be in charge and so he also embarrasses his dad, suggesting the old man should live far more humbly than he is accustomed to. 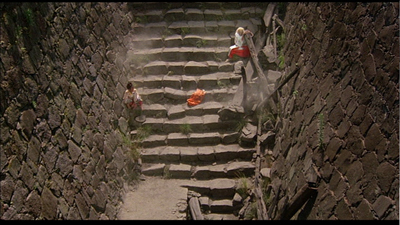 Enraged, Hidetora leaves again, heading to Saburo’s abandoned castle. The exiled son’s army has already left it, heading toward Fujimaki’s province to rejoin their commander. Ran is a colorful spectacle. It’s an historical drama that may take its story cues from Shakespeare but its quiet nature is more reminiscent of traditional Japanese theatre. Kurosawa and his trio of photographers (Takao Saito, Masaharu Ueda, and Asakazu Nakai) frame the proceedings ceremonially, viewing the political debates and wicked scheming from a respectable middle distance. The acts of men are small and contained, whereas the world and nature itself is larger than they are. He shows the hunters on a hillside that takes up 80% of the screen, leaving them to share the remaining 20% with the sky. When Hidetora and his fool (Peter) are at their lowest, we see them lying against opposite walls in a chasm, photographed from above to show how far they have fallen. 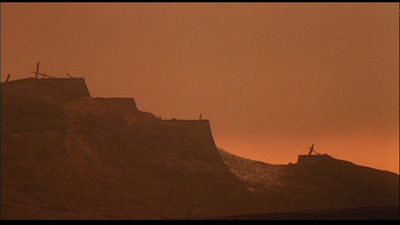 The final shot of the film is of a man standing on a rock wall built out of a hillside, the camera leaping farther and farther away from him until he is indistinguishable from any other object on the hill. For all their bluster and their perceived indignities, these humble players are but tiny specks in a universe that would rather flick them away than indulge their cries of pain. Themes of sin and redemption begin to emerge when Hidetora goes to visit Jiro. The wife of the second son is Sué (Yoshiko Miyazaki), and she is another spoil of Hidetora’s many wars. In opposition to Kaede, Sué is kind and sweet, a practicing Buddhist, and she inspires guilt in a surprisingly compassionate Hidetora. Having his sons treat him so poorly is forcing the old man to look at how he conducted his life. If they have grown up to be so disrespectful, clearly his choices were not as sound as he once thought. Fittingly, then, when Hidetora and the fool end up hiding out in the ruins of Sué’s childhood home, the Lord calls it the final circle of Hell. Hidetora is experiencing a Hell on Earth all around him, and it’s a product of his own misdeeds and of his madness. Signs of senility are shown to us shortly after the hunt that starts Ran. 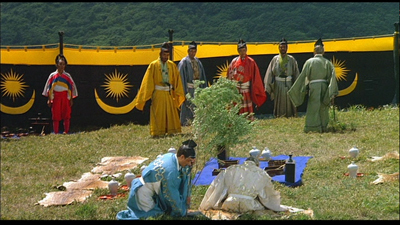 Though the movie’s title card is preceded by a sharp and ruthless Hidetora taking down a wild beast with his bow and arrow, his meeting with his sons and his political rivals immediately after shows a different kind of ruler. His mind wanders, and he falls asleep while they are talking. This is why he cannot recognize that Saburo or his aide Tango (Masayuki Yui) are really on his side. Saburo is the only child who cares about his father, masterfully illustrated by his chopping down leafy branches and making a shade for the sleeping man so he won’t get sick in the sun. Yet, when Hidetora awakes, he doesn’t notice the kind gesture. Instead, he comes bursting through the partition they have set up out in the grassy fields, unsure of where he is, and frightened. This foreshadows the full-blown mental break he will suffer later in the picture, shortly after his square-off with Jiro. 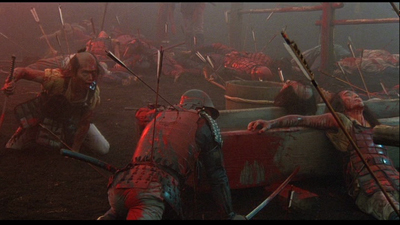 The siege of Castle Three is the most memorable of the many visually astonishing sequences in Ran. Not long after Hidetora has set up camp and gone to rest at the uppermost tower in Saburo’s palace, both Taro and Jiro attack. Outmanned and outgunned, Hidetora’s meager forces fall under the full armies brought to battle by his sons. It’s also where Jiro makes his move, and brother betrays brother. It’s significant that this is the only sequence in the movie where the silence is completely broken and music is used in full. There were hints of an orchestral score in the opening credits and in transition scenes prior, but the rest of the scenes are shown without any musical accompaniment. 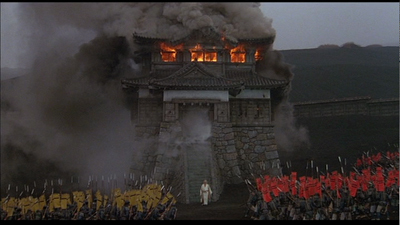 When the soldiers storm the palace gates, Toru Takemitsu’s score takes over completely. The bloody battle plays out like a silent movie. We don’t hear the cries of the many dead, we only hear the mournful music. The orchestra is stopped by a gunshot, one single explosion giving away to a cacophony of murder. The title Ran can be translated to mean either “chaos” or “revolt”--both of which are at work here. The fool warns his master that Hell is all around, and this metaphor detonates during this battle scene. The grotesque images of death and anguish, the fire-engine red of the blood staining the black soil of Saburo’s land, makes the interior of the castle look like a dumping ground for tortured souls. Hidetora is high above it, but he is not immune to it, and when Hell blossoms, so too does his madness come into full. 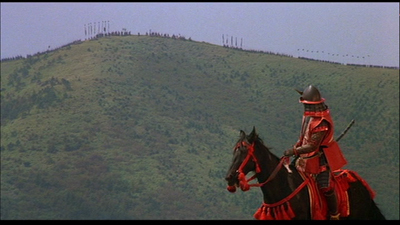 Kurosawa has loaded up on the symbolism here. Hidetora must descend down into the carnage, leaving his armor behind to burn as the castle falls. When he emerges from the dark smoke, he looks like the undead. His skin is pale, but his wrinkles and the circles under his eyes are dark. The armies part to let him pass. No one wants to mess with a restless zombie. There is no underestimating actor Tatsuya Nakadai’s importance to the success of Ran, or as part of Kurosawa’s 1980s renaissance, which began with Kagemusha, starring Nakadai as a king and a pauper. He is a long way from his 1960s roles for Kurosawa, playing Toshiro Mifune’s nemesis in Yojimbo and Sanuro. Though only just past 50 at the time of shooting Ran, Nakadai doesn’t appear to be putting on an act by playing the older Lord Hidetora. His make-up gets exaggerated midway through the movie as the man goes looney tunes, but in the early scenes, the actor’s face accepts the more realistic aging process quite naturally. This is made all the more convincing by his manner. His gait and his bearing is one that speaks of experience. 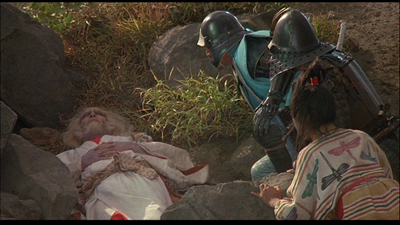 His posture is strong and commanding, and as Hidetora loses his grip, Nakadai lets his carriage deteriorate, practically folding in on himself. The intensified aging make-up is meant to enforce the notion that Hidetora is the walking dead. He is literally decaying his way into the grave. When his robe blows open, we see his spindly, skeletal legs. He is becoming a bag of crazy bones. As in Lear, the very weather is attuned to the ruler’s madness. 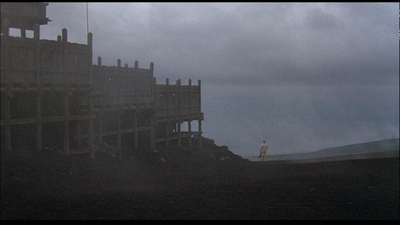 Clouds roll in, wind and rain lash at the people and the ground below, and for the rest of the movie, even when the rains have subsided, Kurosawa employs some remarkably realistic lighting effects where the exterior dims and brightens and then dims again, replicating the clouds passing by the sun and obscuring its light. As another auditory cue, Kurosawa also uses the sound of cicadas to create a buzz around Hidetora, as if their clicks and clacks are the noise in his head. If we consider what I wrote above about nature overpowering mankind, however, then we also must view this “madness storm” in a different way. It’s not that Hidetora is in tune with the weather, it’s that he’s out of tune with the natural world, with what is proper. After he disappears from Castle Three, Hidetora is out in a field trying to gather wild flowers. 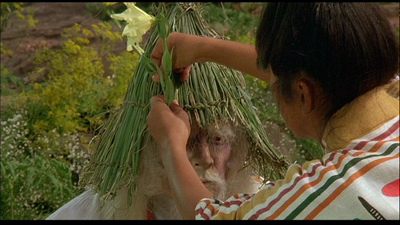 While this is kind of a traditional signifier of a madman in literature--often they wear flowers in their hair--it can also be seen as Hidetora directly trying to reconnect. It also recalls the last kindness he has seen, Saburo building him the leafy shelter. The fool distorts that kindness by building his Lord a new helmet out of weeds and reeds, practically putting the flowers in his hair for him. The withering old man wearing the jester’s cap is a sad, far cry from the armor that was turned to ash by his boys. It’s interesting to consider that during all of this, the fool, whose name is actually Kyoami, is wearing clothes outfitted with a dragonfly pattern. Dragonflies can be seen as symbolizing multiple things. Ironically, in Japanese art, they were often meant to show positive change and joy, the absolute opposite of what is going on in Ran. 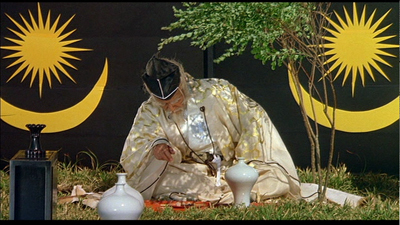 Equally ironic in the case of poor Hidetora, for older people, dragonflies are supposed to signify mental clarity. These insects tend to be associated with transformation, not dissimilar to butterflies. In some representations, they are said to inhabit two worlds, because they begin their life in water and then take flight. If the fool and his master are stuck in a Hell on Earth, this would make some sense. Likewise, the fool’s function is to operate as both a faithful servant and as someone who mocks whom he serves, and he is both himself and another character. In an enlightening real-life parallel, the actor who plays the fool goes by Peter because as a young man his tight outfits and style of dancing in nightclubs earned him the nickname “Peter Pan.” The boy who wouldn’t grow up is forced to be damn serious by the end of Ran. Another major theme of the movie is how truth has been subverted by lies. The fool notes that the whole world has gone topsy-turvy. Saburo and Tango are exiled for speaking their minds, while Jiro and Taro use deceit to bring reward. Jiro is also sunk by the lies of Kaede, who is easily the most deceitful and evil character in Ran. She continually calls for the death of Sué, who is her moral opposite, and when Jiro’s right-hand man, Ogura (Norio Matsui), tries to stop her, he risks the same fate as Tango. This would be something he would have brought on himself, however, as the true mastermind behind Jiro betraying his elder brother and the one who fired the assassin’s bullet. When truth is punished, it makes room for the lies, and there is little a man can do to correct his blunder. As Ogura discovers, there are too many people willing to exploit the hole you’ve opened in the defenses. Let one falsehood in, and a battalion of them come flooding through. His only choice is a very Japanese one: step up and take your death honorably. Hidetora is also incapable of righting the wrongs he has done. Even returning to the scene of his greatest crime, tearing down Sué’s home, brings him little succor. Ran in this way is a very cynical movie. Saburo may maintain his core values and continue to do the right thing, but he must pay the ultimate price. That is the nature of a tragedy: all the players, good or bad, must be taken off the field before the game can be reset. 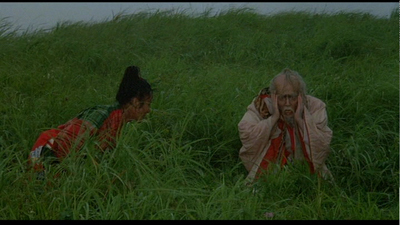 A famous quote from the film comes in response to Hidetora crying out that he is lost. The fool tells him, “That is the human condition.” We could conjecture then, that the last man standing, the blind man (Takeshi Nomura), is the stand-in for all of us. He’s the one who becomes so small as to be indistinct, trapped on a precipice with no idea how to get off. We are left with another frozen shot. Stillness. And silence returns in that moment when the screen blinks black. 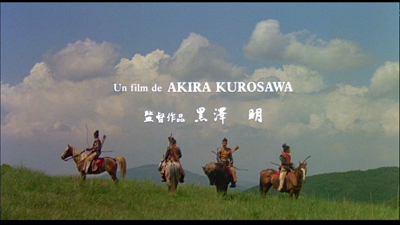 On a personal side note, Ran is the first Akira Kurosawa film I ever saw. I caught it on PBS, my guess is around 1986 or so. It was a part of an education I was giving myself in film. I had basic cable in my room, and so had access to TNT and AMC back when they showed classic films. But it was PBS that introduced me to Japanese movies, including more Kurosawa to follow and Kenji Mizoguchi’s Ugetsu. Ran is now the second of Kurosawa’s films I have seen on a big screen, and this review was written after viewing a new print at Portland’s legendary Cinema 21. It looked and sounded amazing, and if you’re in the area, Ran is booked at the theatre starting on April 9. 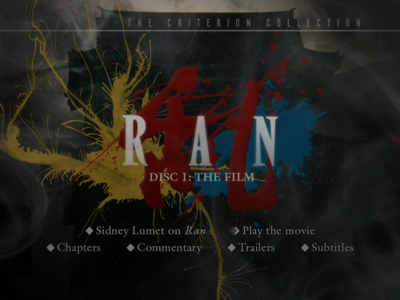 The Criterion of Ran is, alas, out of print, replaced by a not-so-hot Lionsgate/Studio Canal Blu-Ray. Buy this version if you can get your hands on it.